, an English miscellaneous writer, and poet of considerable merit, was nephew to the preced ng, being the younger son of general George Boscawen, third son of lord Falmouth. He was born August 28, 1752, and was sent to Eton school before he was seven years old, where he obtained the particular notice and favour of the celebrated Dr. Barnard. 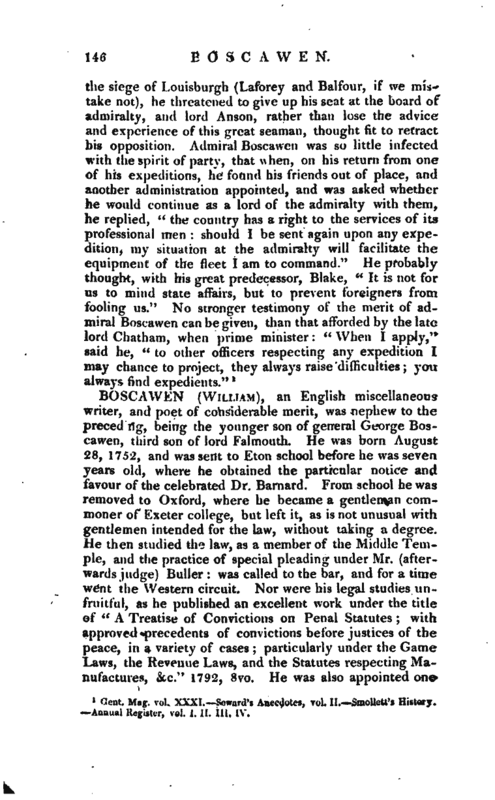 From school he was removed to Oxford, where he became a gentleman commoner of Exeter college, but left it, as is not unusual with gentlemen intended for the law, without taking a degree. He then studied the law, as a member of the Middle Temple, and the practice of special pleading under Mr. (afterwards judge) Buller: was called to the bar, and for a time went the Western circuit. Nor were his legal studies unfruitful, as he published an excellent work under the title of “A Treatise of Convictions on Penal Statutes; with approved precedents of convictions before justices of the peace, in a variety of cases; particularly under the Game Laws, the Revenue Laws, and the Statutes respecting Manufactures, &c.” 1792, 8vo. He was also appointed one | of the commissioners of bankrupts, which situation he held till his death. On Dec. 19, 1785, he was appointed by patent to the situation of a commissioner of the victualling office, in consequence of which, and of his marriage in, April 1786, he soon after quitted the bar. He married Charlotte, second daughter of James Ibbetson, D. D. archdeacon of St. A 1 ban’s, and rector of Bushey. 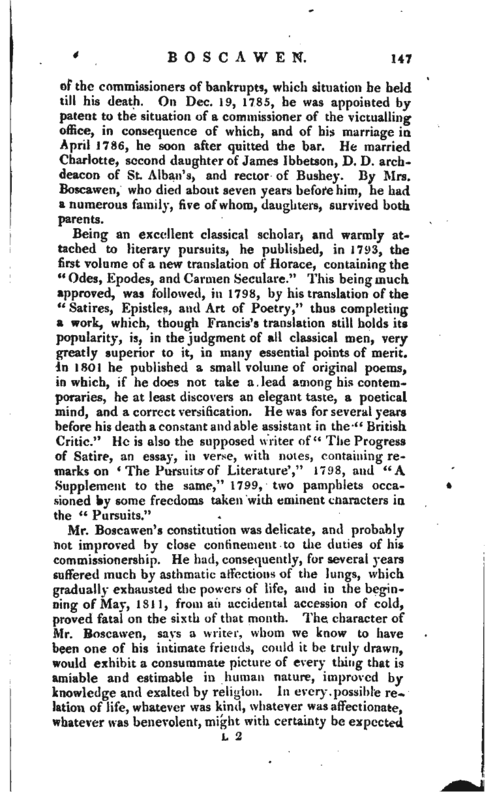 By Mrs. Boscawt’n, who died about seven years before him, he had a numerous family, five of whom, daughters, survived both parents. Gent Mag. 1811—New Cat. of Living Authors, vol. I. 1799.—Brit. Crit. vol. 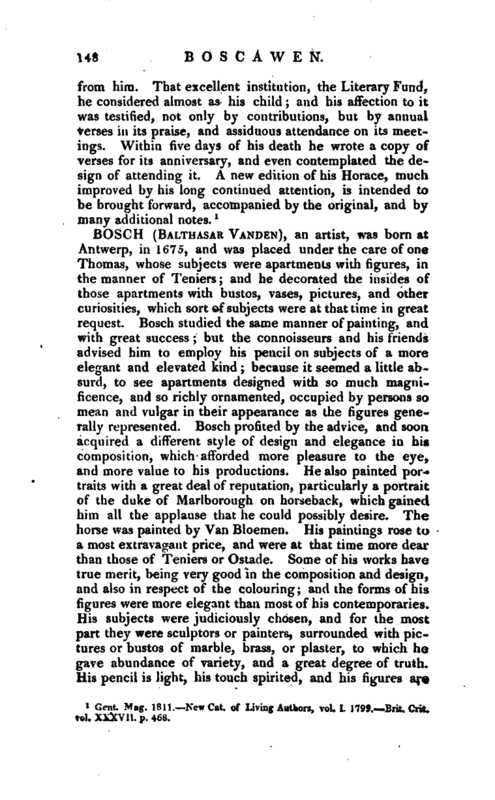 XXXVII, p. 468.